Fleconn power connector can be interchangeable, interconnected and installed with industry standard products. Can gain greater flexibility when it plugs with the existing wiring harness, connectors or printed circuit board connector. Fleconn power connector can be interchangeable, interconnected and installed with industry standard products.Can gain greater flexibility when it plugs with the existing wiring harness, connectors or printed circuit board connector. 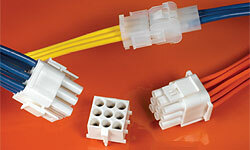 Enclosure design is suitable for plug pin and socket terminals. In addition, the shell also accepts industry-compatible terminals.